Offering you a complete choice of products which include cube testing machine pillar type, compression testing machine pillar type, length comparator and cube testing machine. Cube Testing Machine We are leading supplier of wide range of cube testing machine. 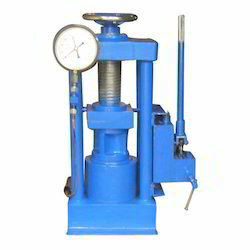 Our range of cube testing machine is widely used in the construction industry. Cube testing machine is manufactured as per the national and international quality standards thus provides high efficiency. Suitable to test 150mm x 150mm concrete cube complete with M. S. Frame, spacers, hydraulic jack with hand operated oil pumping unit. We are dealing in Gujarat. We feel proud to introduce ourselves as the leading enterprises for offering top quality Hand Compression Testing Machine that is ideally suited for mobile and field laboratories. This testing machine is designed for portability, operating convenience and accuracy. 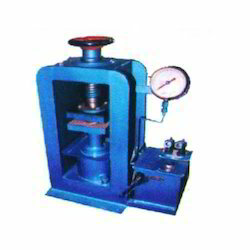 Our offered testing machine is checked on numerous parameters before supplying in the market. 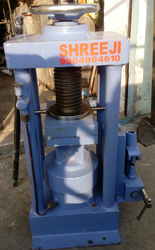 Customers can avail the offered testing machine from us in various specifications as per their requirements. By keeping track with latest market development, we are engaged in offering our clients a broad array of Length Comparator. 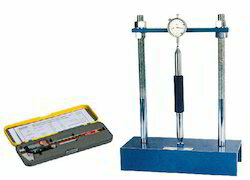 The offered length comparator is designed keeping in mind the standards of market using excellent quality of material. This length comparator is used to measure the dying shrinkage of concrete autoclave expansion of Portland cement. Customers can easily avail this length comparator from us in a confine time at nominal rates.